Bee Movie is a 2007 CGI-animated film starring Jerry Seinfeld, Renée Zellweger, Matthew Broderick, Megan Mullally, John Goodman, Chris Rock, Kathy Bates, and Patrick Warburton. Produced by DreamWorks Animation, it is directed by Simon J. Smith and Steve Hickner. 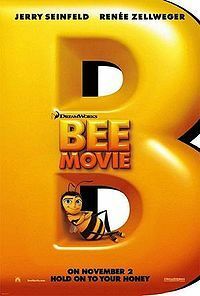 Bee Movie is the first motion-picture script to be written by Seinfeld, who co-wrote it with Spike Feresten, Barry Marder, and Andy Robin. The film was produced by Jerry Seinfeld, Christina Steinberg and Cameron Stevning. The production was designed by Alex McDowell, and Christophe Lautrette was the art director. Nick Fletcher was the supervising editor and music for the film was composed by Rupert Gregson-Williams. The cast and crew include some veterans of Seinfeld's long-running NBC sitcom Seinfeld, including writer/producers Feresten and Robin, and actors Michael Richards (Seinfeld character Cosmo Kramer), Patrick Warburton (Seinfeld character David Puddy), and Larry Miller (who plays the title character on the Seinfeld episode "The Doorman"). She has voiced for Charlotte's Web, the 2006 film as Gussie the goose. She is also the voice of Judge Bumbleden in Bee Movie (2007) co-starring the voices of Jerry Seinfeld and Renee Zellweger.